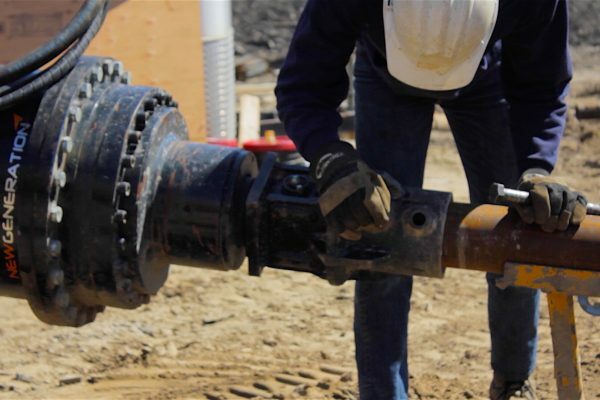 Helical piers, large diameter piles, and micropiles are installed with a drive head mounted on a machine. Backhoes, skid-steer loaders, and other excavators can be rigged with an appropriate drive string assembly to install piles and anchors. The drive head selected must be compatible with the hydraulic flow (gallons per minute) of the machine on which it is mounted. Larger diameter piles require more torque, while most helicals can be installed with small, low-impact equipment and smaller drive heads. Danbro has 22 years of experience in creating drive-string assemblies to install helical piers. We assist new and existing installers in selecting the drive tools, torque indicator, and drive head that will best comport with your machine and the nature of your construction business. Virtually any hydraulic equipment can be adapted to install helical piles. Not only will we help you select the correct component parts to best suit your needs, we will join you in the field to assemble and test them. Featuring precision planetary gears and bearings in an oil-filled, sealed gear case with durable, heavy duty output housing and bearings, foundation drive heads are vehicle-mounted and hydraulic-powered with available torque ratings of 6,000 or 11,500 ft lbs. They are suited for vertical installations of foundations, screw-type anchors, and bumper posts. The dual-pin mounting provides drive head positioning for controlled installations and a bail flange, mounted to gear case housing, provides balanced load-sharing torque restraint. Our drive heads accept earth augers for hole digging; hose assemblies are available. A 3/4″ diameter hose is recommended for hydraulic flow of more than 20 gallons per minute; for flow rates of 20 gallons per minute or less, a half-inch hose may be used. Swivel joint and swivel joint adapters are furnished. Thread size is 1″- 11 1/2″ National Pipe Straight Mechanical.